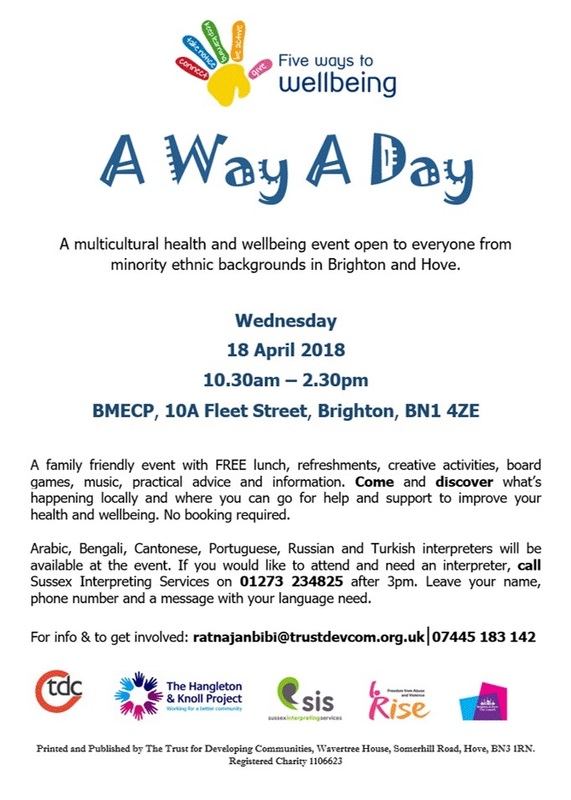 Join TDC at A Way A Day – our multicultural health and wellbeing event open to everyone from minority ethnic backgrounds in Brighton and Hove. A family friendly event with FREE lunch, refreshments, creative activities, board games, music, practical advice and information. Come and discover what’s happening locally and where you can go for help and support to improve your health and wellbeing. No booking required. Arabic, Bengali, Cantonese, Portuguese, Russian and Turkish interpreters will be available at the event. If you would like to attend and need an interpreter, call Sussex Interpreting Services on 01273 234825 after 3pm. Leave your name, phone number and a message with your language need. Please print out and display our poster to help spread the word about our event.